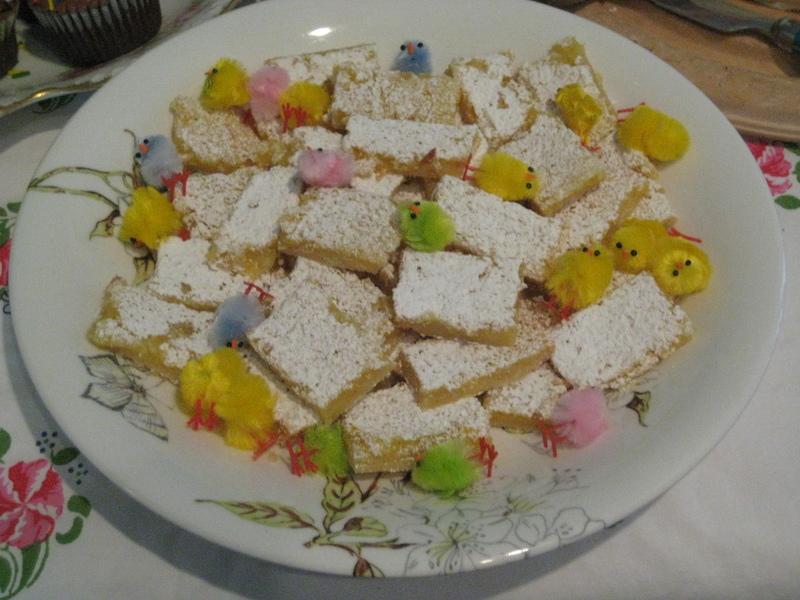 For her Easter Sunday egg hunt lunch party Aunt Caroline asked for sweet treats – what could be nicer than bite size lemon bars? Joan’s on Third makes the best lemon bars but they were too big for what we needed. So we took the recipe and used a bigger dish rather than an 8 inch square pan for her recipe – the result thinner smaller treats. 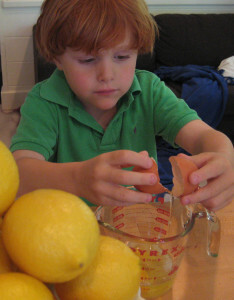 We also used Meyer lemons and regular lemons from our garden and included some of the lemon zest. Minty and Rémy then had a fight over who could crack the eggs so I let them each take one. Rémy went first – success! Minty cracks an egg – oops! Minty was next, technique not quite there – but at least she’s smiling about the mess. Adapted from Joan’s on Third. 1. Heat the oven to 350 degrees. In a mixer with the dough paddle, combine the melted butter with 1 cup flour, the powdered sugar and the almond extract, until the dough comes together. Pat the dough into a 12 x 8-inch ovenproof dish and bake just until lightly golden, about 18 minutes. Remove and cool the pan on a wire rack to room temperature. 2. In a mixer, whisk together the granulated sugar, baking powder and remaining 2 tablespoons flour. Whisk in the lemon juice, zest and eggs until thoroughly combined. Pour the custard into the pan over the baked crust and bake again until it’s set, 20 to 25 minutes. Remove and cool the tart on a wire rack. 3. When cooled cut into small bit sized pieces and dust with powdered sugar. The lemon bites will keep for 1 week, refrigerated.